Props to Bloomberg for the chart. We're looking at three months' worth of China's Shanghai (Shenzhen Composite Index) market, and we're looking at multiweek lows. That, in itself, might not be newsworthy, other than the fact that economists in China are now joining the call for a stronger Yuan. The Yuan has hit its highest level relative to the dollar, a development reportedly supported by the U.S. Treasury Secretary. New IPOs are weighing on the Shanghai market and liquidity concerns abound. So far, China's command economy has not done a good job of obeying commands; the recent response of Shanghai stocks to Yuan strength suggests that, for better or for worse, markets may at last be listening. Are market returns superior at month's end, when institutions may put capital to work? I decided to take a look. Specifically, I went back to late December, 2002 (N = 903 trading days) and examined returns from the last three days of the month and the first three days of the following month. These six day periods averaged a gain in the S&P 500 Index (SPY) of .15% (156 up, 102 down). That is stronger than the average one-day gain of .04% (494 up, 409 down) for the entire sample. A look at the 2006 figures suggests that this outperformance has not fallen prey to changing cycles. Since late December, 2005, the average gain in SPY during the last three days of the month and first three days of the next month has averaged .11% (25 up, 17 down). That is stronger than the average one-day gain in SPY of .02% (75 up, 72 down) over that same period. It does appear that, during the recent bull market, the ends and beginnings of months have been positively tinged. My calculations show that the first three days of the month have been particularly bullish, averaging a gain in SPY of .20% (77 up, 51 down) since 2003. What does it mean when traders are buying or selling stocks in the last hour of the day? Some have suggested that this might be a "smart money" indicator, in that institutions that want to position themselves for anticipated moves will do so prior to the close to take advantage of overseas strength or weakness. Another way to view trading in the last hour is as a sentiment gauge. Heavy buying (selling) in the last hour means that bulls (bears) are so convinced of their positions that they're not willing to wait until the next day's open to place their orders. Yet another view is that buying/selling in the last hour reflects risk-taking (willingness to assume overnight risk), while avoidance of buying/selling reflects risk aversion. Whatever the explanation, we can see that a cumulative index of price changes in the Dow over the last hour of trading has failed to keep up with the Dow's price advance since the end of 2004. Early in the bull market, traders were buying during the last hour. Since 2005, this has not been the case. Even on Friday and over the past two weeks, when we had a nice pop in the Dow, there was no push to buy in the last hour. Is smart money avoiding the market? Is sentiment bearish? Are traders behaving in a risk-averse fashion? Perhaps all the above. What we can see for certain is that willingness to step up and buy in the last hour has essentially vanished from this market. With the Rydex equal-weighted S&P 500 ETF (RSP), traders can now trade a version of the popular market average that has performed quite well in recent history. (See today's entry in the Trading Psychology Weblog for a chart). Going back to May, 2003, for example, the weighted S&P (SPY) has been up about 39%. The unweighted RSP, however, has risen by almost 66%. What that's telling us is that the smaller components of the S&P 500 have outperformed their larger counterparts--which is exactly what we've seen with the outperformance of the small and mid caps relative to large caps over the same period. During the past five days of trading, SPY has been up by 3.25%, but RSP has lagged a bit, with a gain of 3.07%. Since May, 2003 (N = 809), we've had 48 days in which SPY has been up more than 2.5% over a five-day period. Over the next five days, SPY has been up on average by .66% (33 up, 15 down). That is much stronger than the average five-day gain of .20% (454 up, 355 down) for the entire sample. When we divide the strong SPY periods in half, however, based on RSP performance, a pattern emerges. When SPY is strong over five days and RSP is relatively strong compared to SPY (N = 24), the next five days in SPY average a large gain of .96% (17 up, 7 down). When SPY is strong over five days and RSP is relatively weak (N = 24), the next five days in SPY average a gain of .37% (16 up, 8 down). In other words, a strong five-day period since May, 2003 has led to strength over the next five days, but that strength has been more pronounced when the small stocks in the S&P 500 Index have been outperformers (which has not been the case over the last week). Once again, however, we do have to be concerned about changing cycles. Since the start of 2005, we've had 10 occasions in which SPY has been up by more than 2.5% in a five-day period. Five days later, SPY has been up 4 times, down 6, for an average loss of -.10%. In 2006, three of the four occasions in which we've seen a strong SPY (up more than 2.5% over five days) have led to losses five days later. In my last entry, we found that 10-day rises that were smooth--i.e. that had seven or more of its days finishing to the upside--had a more favorable short-term outcome than ten-day rises that were choppy, with four or more declining days in the mix. This was not because the smooth rises were larger than the choppy ones; their average size was quite similar. Rather, it appears that how a market moves from Point A to Point B matters as much as the size of the move itself. I went back to the entire sample from February, 1996 (N = 2618 trading days) and simply compared smooth ten-day rises in SPX (those with 7 or more up days) with smooth ten-day declines (those with 7 or more down days). Here there is an obvious overlap with price change: the smooth 10-day rises averaged a gain of 3.24%; the smooth 10-day declines averaged a loss of -4.05%. When SPX had seven or more days out of 10 to the upside, (N = 499), the next five days in SPX averaged a gain of only .08% (288 up, 211 down). That is no better than the average five-day change of .16% (1422 up, 1196 down) for the entire sample. When SPX had seven or more days out of 10 to the downside (N = 301), the next five days averaged an above average gain of .47% (174 up, 127 down). That is quite a bit better than average. A different pattern appears when we look 20 days out, however. When SPX has been up 7 or more times out of 10, the market 20 days later averages a gain of .82% (302 up, 197 down). That is a bit stronger than the average 20-day gain of .61% (1521 up, 1097 down) for the entire sample. When SPX has been down 7 or more times out of 10, the market 20 days later averages a gain of only .36% (156 up, 145 down). When we put those results together, what we find is that markets that move smoothly do not follow through on their moves in the next five trading sessions--and indeed often correct a bit--but then do follow through with their original moves in the subsequent 15 sessions. The paths of various rises and falls across different time frames strikes me as a fruitful line of further inquiry. A smooth trending move appears to correct in the short run before continuing in its original direction thereafter. If a market moves from Point A to Point B in a smooth, steady fashion, does that lead to different short-term outcomes than if the move is choppy? For instance, over the last two weeks (10 trading days), we've risen almost 3.5% in the S&P 500 Index ($SPX). The move has been relatively choppy, however, with five of the days rising and five declining. I went back to February, 1996 (N = 2618 trading days) and found 565 periods in which SPX had risen between 2%-5% in a ten-day period. When the move was smooth--seven or more of the days rising (N = 248)--the next ten days were up on average by .44% (154 up, 94 down). When the move was not smooth--six or fewer of the days rising (N = 317)--the next ten days were up on average only .08% (166 up, 151 down). It thus appears that rises interspersed with selling have poorer near-term outcomes than rises that are smooth and consistent. 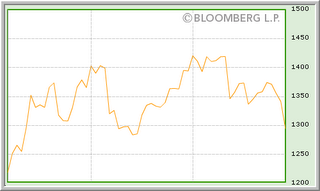 The market's recent 10-day rise, by this gauge, is not necessarily a stimulus for superior returns going forward. This smoothness/choppiness is a variable that could be studied across many time frames--intraday as well as daily--for any trading instrument. I will be following this up with further investigations. "Just because you've got a nice, solid, grown-up stock portfolio doesn't mean you can't have any fun. Why not add currency trading into the mix...It's fast, exciting, open 24 hours a day--and there are no commissions...But best of all, it's easy to get started. All you need is $250 to open an account." Now reread the above copy and just substitute the words "casino gambling" for "currency trading". You get the picture. What is even sadder is that, after traders have run through their several hundred dollar trading stake (no doubt aided by the 3-pip wide spreads that accompany "free" trading), many of them contact me as a trading psychologist. They (incredibly) harbor hopes that they will parlay hundreds of dollars into many thousands and they're seeing those dreams dashed before their eyes. So I end up playing Simon Fuller and telling them that they don't actually have a good voice and can't possibly be America's next Idol. "Due in part to its size, Forex is less volatile than other markets. Lower volatility equals lower risk. For example, the S&P 500 Index trading range is between 4% and 5% daily, while the daily volatility range in the Euro is around 1%." WTF?? Forex is *less* volatile than the S&P 500 Index?? Even ignoring the fact that currency traders typically trade with more leverage than equity traders, since when has the S&P 500 Index sported trading ranges between 4 and 5% daily?? That would be the equivalent of 50-60 ES points every single day!! In this case, I actually wrote to the firm and reported research that showed that Forex was *not* less volatile than equities (actually, it has a more leptokurtic distribution of price changes, with lots of small ones and a smaller number of phenomenally large ones) and was not a superior trending vehicle (the conditional probability of the next period following the direction of the previous one was no better than 50/50 and actually somewhat worse). I received no reply to my research. To this day, the advertorial copy hasn't been changed. So there it is. One company markets currency trading as a casino, the other as a safe haven with non-volatile trending. Either way, I get the emails describing dashed hopes and expectations. My previous post found that the S&P 500 Index tended to reverse moves when those moves were accompanied by both an expansion of new 20-day highs and new 20-day lows. When more stocks make new lows on an up day or vice versa, the next day tends to retrace the previous move. During the past three trading sessions in SPY, we've been up significantly but the number of stocks during that time that have shown strong upside momentum, as measured by my Demand/Supply measure (which is given daily in the Trading Psychology Weblog), has declined during that time. When the stocks contradict the market by showing waning momentum in the face of price gains, what happens next? Since September, 2002 (N = 963 trading days), we have had 139 occasions in which SPY has been up by more than 1.5% over three trading sessions. When those three sessions are accompanied by declining stock momentum (N = 71), the next four days in SPY average a gain of .05% (40 up, 31 down), weaker than the average four-day gain of .17% (532 up, 431 down). When, however, the three strong sessions are accompanied by broadening stock momentum (N = 68), the next four days in SPY average a sizable gain of .64% (43 up, 25 down)--much stronger than average. Once again we see that what happens among individual stocks truly affects the broad market. When market rises are accompanied by broadening upside momentum, near-term returns have been much better than when rising prices have been contradicted by narrowing momentum. Yesterday we had a rising market, but the number of stocks making fresh 20-day lows increased, even as we had an increase in new 20-day highs. What happens when stocks contradict the market and expand new lows on rising days and expand new highs on falling days? Since September, 2002 (N = 963 trading days), we've had 92 occasions in which the market (SPY) has risen on the day with expanding new 20-day highs, but also with expanding new 20-day lows. This is what we saw yesterday. The next day of trading, SPY was down by an average -.20% (42 up, 50 down). That is much weaker than the average one-day gain of .04% (517 up, 446 down) for the entire sample. Conversely, when SPY has fallen for the day, but new highs have expanded as well as new lows (N = 84), the next day in SPY has risen by a strong .19% (54 up, 30 down). It thus appears that market moves that are contradicted by the stocks tend to reverse the next day. It is but one more reminder that the market of stocks does indeed affect the stock market. This week has gotten off to a bang, with rises on Monday and Tuesday providing us with more than a 2% gain in the Dow Jones Industrial Average. But what happens when the market starts the week with a bang? Do we get more fireworks later in the week or does the bang become a whimper? I went back to December, 1988 (N = 4443 trading days) and found exactly 100 occasions in which the market was up on both Monday and Tuesday and had a total two-day gain of over 1.5%. Two days later, the Dow was down by an average -.21% (42 up, 58 down), which is much weaker than the average two-day gain of .08% (2384 up, 2059 down) for the entire sample. Interestingly, we have not started the week with a bang at all up until now in 2006 and only had one occasion in 2005. Since the recent bull market began in March, 2003, we've had 12 starts to the week with a bang. Two days later, the market was up 5 times, down 7 for an average loss of -.13%. Also interestingly, consecutive two-day gains which, together, produce a rise of more than 1.5% show somewhat subdued returns, but nothing as subnormal as the two-day "bang" gains at the start of a week. At least in recent market history, strong starts to the week have not produced strong finishes. Yesterday's post took a look at sentiment on a longer-term basis; today we'll look at a very short-term measure of sentiment. The NYSE TICK tracks the cumulative difference in the number of stocks trading at their offer price minus those trading at their bid. As a result, it is an excellent measure for identifying the degree to which traders in the broad market are aggressive buyers (transacting at the offer across many different stocks) vs. aggressive sellers (hitting bids across many issues). Each day in the Trading Psychology Weblog, I provide a daily summary of a version of the NYSE TICK that is adjusted to create a zero mean. Positive values of the Adjusted TICK thus indicate net positive short-term sentiment on the day, while negative values reveal net negative short-term sentiment. Monday was truly a big swingin' TICK day: We were up solidly from Friday's close to Monday's open and then added significantly to the gains through the session on a strong Adjusted TICK. This means that there was strong positive sentiment, and that sentiment was carried out in action. I went back to July, 2003 (N = 765 trading days) and found only 10 big swingin' TICK days in the S&P 500 Index (SPY). Those occasions had to be up from the previous close to the current open by more than .30% and had to be up from open to close more than .50%, with an Adjusted TICK greater than +700. Interestingly, two days following the big swingin' TICK day, SPY was down by an average of -.50% (3 up, 7 down)--much weaker than the average two-day change of .06% (403 up, 362 down) for the entire sample. What is even more striking is that strong TICK days that are *not* big swingin' TICK days (i.e., that aren't up strongly close to open and again from open to close; N = 47) have quite favorable expectations over a two-day horizon. Specifically, they are up on average by .27% (27 up, 20 down). What this suggests is that there is a tendency for the market to correct in the near term when highly positive short-term sentiment provides sustained price gains. A hard man may be good to find, but the market apparently doesn't like big swingin' TICKS. David Korn makes the interesting observation that the sentiment data from the AAII are highly skewed toward the bears. Indeed, with roughly 58% bears and only 24% bulls, this is one of the most bearish readings since 1989 (N = 906 weeks). Of course, I wanted to see if such highly bearish sentiment truly is associated with intermediate-term market returns. First off, we've only had 25 weekly occasions in which bears have been over 50%. Of these readings, 16 occurred during the late 1990-early 1991 period, which was a major market bottom. Other times we've seen over 50% bears have been February-March, 2003 (another major bottom); individual weekly readings from July - October, 2002; and individual readings in March and December, 2000. On 20 of these 25 occasions, the Dow Jones Industrial Average (DJI) has been down for the 10 weeks *prior* to the bearish sentiment reading. In other words, bearish sentiment has tended to occur after prolonged market weakness. This is true of the current bearish sentiment reading as well. When bears have exceeded bulls by more than 20% in the AAII survey (N = 46), the next ten weeks in the Dow have averaged a gain of 4.48 (37 up, 9 down). That is a whopping advantage over the average 10-week gain in the Dow of 1.93% (596 up, 310 down) for the entire sample. Conversely, when bulls have exceeded bears by 30% or more (N = 142), the next 10 weeks in the Dow have been up by an average of only .83% (78 up, 64 down)--less than half the average return for the sample. Interestingly, when bears have exceeded bulls by more than 20% and there has been a bullish advantage going forward, the *previous* ten weeks in the Dow have been down on average by over 4%. When the bulls have exceeded the bears by more than 30% and there have been subnormal returns going forward, the previous ten weeks in the Dow have been *up* on average by over 4%. So there you have it. Down markets followed by extreme bearish sentiment have tended to be bullish in the intermediate-term; up markets followed by strongly bullish sentiment have tended to yield subnormal returns in the next two months. Occasions in which we've had more than 50% bears have tended to be either major cyclical bottoms or intermediate-term low points during bear markets that have preceded sharp rallies. Please note that these are small samples, particularly given the clustering of bearish readings at certain points in time. Per the Trading Psychology Weblog's Monday entry, note also that we have been seeing a recent reduction in stocks registering new intermediate-term lows--a surprising finding as bearishness has expanded. Charles Kirk of The Kirk Report referred to Friday as a salmon day. By that he meant that the market struggled to move higher early in the day only to be pushed backward as the day wore on. I thought that was a particularly descriptive metaphor for what Friday's market felt like. Of course, that had me thinking about ways of quantifying salmon days. I decided that, for this first attempt, a salmon day would be a day that had the following characteristics: 1) a higher open (to show the salmon moving upstream); 2) a move from today's open to high that was weaker than the move from yesterday's close to today's open (to show the poor fish struggling); 3) a range between today's high and low that exceeded 1% (to show a reasonably strong current to the stream); and 4) today's close within .25% of today's low (to show the salmon losing the struggle). Lo and behold, I found that, not only was Friday a salmon day, but Thursday qualified as well! Clearly this is a bagel and cream cheese market. To my surprise, we've only had two other bagel and cream cheese occasions (i.e., two back to back salmon days) in the market since January, 1996. FWIW, the market was solidly higher after two days following both of those occasions. Overall since January, 1996 (N = 2625 trading days), we've had 90 salmon days. Three days later in the S&P 500 Index (SPY), the market has been up by an average .37% (54 up, 36 down). That is considerably stronger than the average three-day gain of .10% (1420 up, 1205 down) for the entire sample. These superior gains following salmon days occurred between 2004 and the present (N = 19), although to a more moderate degree. All three salmon days in 2006 to this point have been solidly profitable three days later. In short, lox aren't so bad for stocks: traders don't seem to get smoked after salmon days. Indeed, after falling back following an opening advance, the salmon tends to make some progress in the near term. The larger point is that thinking in images and metaphors--a trademark, by the way, of Victor Niederhoffer and Laurel Kenner's website--can often lead to fruitful hypotheses that can be quantified. It is at this junction of art and science that traders can often find creative edges in the marketplace. The one thing short-term traders should know is that size matters. It is of vital importance at all times to know whether the traders in size are leaning to the buy or sell side. Because volatility is intimately connected to volume, the presence or absence of large traders will determine the amount of movement in the market. The degree to which large traders are hitting bids or lifting offers will determine the market's tendency to sustain directional moves (i.e., trend). (IMO, understanding--really understanding--those last two sentences will keep many traders out of bad trades and bad markets). Let's take the opening period of Friday's trade as an example. I'm looking at the time period just before the NYSE open to the end of the first half hour of trade (9:25 AM - 10:00 AM ET) in the S&P 500 e-mini (ES) market. During that period, we had 13,954 trades that included 212,684 contracts. Of these trades, 5148--almost 40%--were one-lots. Those one-lots accounted for about 2-1/2% of all market volume during the opening period. Conversely, 431 trades--only about 3% of the total--were trades of 100 contracts or more. This group of large traders, however, accounted for 82,127 contracts traded, or nearly 40% of the total. So there you have it. Give or take a bit, the smallest 40% of trades account for 3% of the volume, and the 3% of largest trades control 40% of the volume. A number of excellent short-term trading guides can arise from these observations. For instance, we can compare the number of large trades occuring during a time period and compare it to the average number of large trades that occur during that time period, and we'll have a rough idea of the degree to which large players are dominant and volatility can be expected. We can also parcel out the large trades that occur at the bid price (meaning a large seller is anxious to exit the market) vs. the large trades that occur at the offer (a large buyer is eager to get into the market) as a way of tracking the moment-to-moment sentiment of large traders. Trade by trade analyses of market action that capture the sequencing of large trades at market tops and bottoms are also quite revealing, as they display how one-sided markets (those dominated by buyers or sellers) become two-sided when other timeframe participants perceive that the market has moved too far from value. That period on Friday from just before the open to the end of the first half-hour of trade neatly caught such a sequence. There's value in looking at charts of markets that cover many days. That's viewing the market through a telescope. The short-term trader, however, can also benefit from observing the teeming life under the microscope. What moves the market in the short run is not what fundamentally moves the market over the long haul. Taking advantage of the data appropriate for your timeframe is all-important. Tonight, I'll post a chart to the Trading Psychology Weblog that illustrates some of these ideas. Note: A complete market update will be posted to the Trading Psychology Weblog this AM. Wednesday's rise featured the highest ratio of advancing stocks to declining issues--about 6:1--that we've seen since 2001 (N = 1388 trading days). Thursday's market declined following this broad rise. I decided to take a look at how markets follow through on broad rises to see if that might tell us something about the market's near-term future. Since 2001, we've had 43 days in which the ratio of advancing stocks to declining ones was better than 3:1. There has been a bullish edge in the S&P 500 Index (SPY) two days after the broad rise, with an average gain of over .25% (25 up, 18 down). That compares to an average two-day gain in the entire sample of .01% (727 up, 661 down). When the broad rise was followed by a down day (such as happened yesterday; N = 18), the *next* five days in SPY averaged a gain of .46% (12 up, 6 down). When the broad rise was followed by an up day (N = 25), the next five days in SPY averaged a gain of .30% (14 up, 11 down). All told, there has tended to be a bullish leaning to the next five days of trading following a broad market rise. Now for the caveat, however. When the market rise has been *very* broad (i.e., with advancing stocks outnumbering declining issues by more than 4:1), the market has been down on five of those occasions, as reported in today's post on the Trading Psychology Weblog. Could it be that moderately broad rises fare better in the short-run than very broad rises, simply because the very broad rises are indiscriminate in their buying? It's a hypothesis worth looking into. Just as there are two types of trader, there are two basic ways in which psychology can assist traders. The first is by helping traders reduce or eliminate unwanted negative patterns of thought, feeling, or action. This is the trading psychologist’s historical stock in trade. Many traders seek to improve their performance by ridding themselves of bad habits. There is, however, a second way in which psychology can assist traders that is less appreciated. Even when traders have found their edge and are making money, they may not take full advantage of the opportunities that they have. Instead of losing large sums, they are leaving significant money on the table. Such traders can benefit from psychology by learning how to do more of what works. Their goal is to build positive action patterns, not reduce undesirable ones. The confusion of these two modes (and how they sometimes can work together) creates what I call the fundamental mistake of trading psychology. Traders assume that, in order to be successful, they need to dig into their problems and eliminate them. Research tells us, on the other hand, that most highly successful people across a variety of fields—from arts to athletics and science—succeed by maximizing their strengths, not by focusing efforts on their weaknesses. This is such an important topic—and it is so important to avoid the fundamental mistake of trading psychology—that I will post an entire article on the theme to my personal website this weekend. A recent book by management guru Marcus Buckingham makes this essential point: great businesses (and managers) play to their strengths. They don’t get bogged down in efforts to make themselves less weak in particular areas. Instead, they find ways to compensate for weaknesses and take full advantage of strengths. Many traders are much more familiar with their weaknesses than their strengths, especially after they’ve gone through a slump. They haven’t truly analyzed their performance to see what they do well. As long as that is the case, they cannot focus on those strengths and learn to apply them to a greater range of situations. The fundamental mistake keeps them problem-focused, when instead they should be building solutions. Who you ultimately are—and what you’re truly good at—may be different from the person you’re trying to be. Michael Jordan longed to be a baseball player and could have spent untold years working on becoming a decent player. Fortunately, he returned to the NBA and to his very special talents. After an exhaustive review of my trading performance, I found that I was most successful trading short-term morning patterns in the ES. I would love to be a longer-term trader and (at times of volatility and opportunity) a full-time trader, but that is not where my talents lie. The fundamental mistake would have me work on becoming less bad at trading afternoons or longer-term. The right application of psychology has me learning to build my consistency and grow my size at what I do best. Sometimes the greatest challenge is the simplest: to just be who we really are and do what we do best—and embrace that for all it’s worth. Note: I will return to full daily market updates, along with links and market context, on Friday in the Trading Psychology Weblog. After two days of unconvincing consolidation, we broke to the upside on Wednesday in the wake of Fed comments. The gauge of any breakout move is twofold: 1) we look for breadth as well as price strength, as those rising tides that lift all boats are more likely to be sustained; and 2) we look for the first pullback after the initial upthrust and see if the market can hold that level on subsequent selling. Those two conditions make for bull trend days. Breadth was certainly present, as advancing issues outnumbered declines by over 2400 issues on the Big Board. I notice that my measure of Demand was a very, very strong 243; Supply was only 14. For those not familiar with this Weblog measure, it means that the number of stocks displaying significant upside momentum outnumbered those with significant downside momentum by a ratio of about 17:1. With this upthrust, we now see 46% of S&P 500 issues above their 50-day moving averages--not a level normally associated with market tops. The usual pattern is for such broad strength to continue in the near term. Twice during the recent correction that did not happen after we had big up days. Nonetheless, as long as we see prices hold above that initial pullback level and the number of stocks making new highs expand, we have to go with what the market tells us on those big breakout moves. Since the publication of The Psychology of Trading, I've been honored to work with many groups of traders. Some have been home-based and independent; others have worked for proprietary trading firms, hedge funds, or investment banks. FWIW, I would say that, based on this experience, about half of what is written about trader psychology and successful trading is not grounded in reality. A simple example of this is the bromide that successful traders either control or eliminate their emotions in trading. I consistently find this to not be the case. Successful traders are extremely competitive individuals who, as a whole, hate losing. They don't take losing lightly, but they channel that emotion constructively, to enable them to overcome loss. In general, I find there are two kinds of traders. The first kind trades visually, from patterns that are evident on visual inspection. Those include chart patterns, oscillator patterns, Elliott waves, and the like. Their trading decisions are discretionary, in that they elect to buy, hold, and sell based upon their perception of patterns and their judgment as to their meaning. The second kind of trader distrusts visual inspection. Such traders are more likely to buy into the behavioral finance notion that unaided human perception and judgment are subject to a variety of biases. Accordingly, these traders use some form of historical/statistical analysis and/or system development to test ideas and trade only those that test out in a promising way. So there you have it: some traders are risk-takers without a demonstrable edge; other traders are researchers who find an edge but have trouble assuming the risk of trading it. The true rarity is the trader who has both head and gut: the ability to find an edge and the fortitude to trade it aggressively. A useful gauge of market sentiment that is based on what bears and bulls are *actually* doing, rather than on their stated leanings is the ratio of assets in Rydex bear and bull funds. A related set of measures tracks the flows of funds (cash flow) in and out of the bear and bull funds. Carl Swenlin of Decision Point does a great job of tracking these numbers. What we find is that the ratio of bear and money market assets to bull assets is 1.16. Since 2004, intermediate-term bottoms in the market have all seen ratios greater than 1.0 but less than 1.5. Interestingly, this measure hit a very elevated reading of approximately 3.0 at the important cyclical market bottom in March, 2003. Thus, while the current readings are elevated as might be expected during a normal correction in a bull market, they are not the stuff of which bear market bottoms are made. The Rydex cash flow measures show lower peaks for the bull funds and rising peaks for the bear funds, meaning that, with each market advance during much of 2005 and 2006, we see less money put into the bull funds. With each market decline, we've seen more money put to work in the bear funds. We saw more rangebound action on Tuesday, but nothing to change the downward short-term trend. The number of stocks making new 20 day highs was 331; the new 20-day lows were 1748. We need to see sufficiently broad rally action to lift stocks off these lows before a bottoming process can commence. The last two days of consolidation have not provided that broad strength. On another front, we see 30% of S&P 500 stocks trading above their 50-day moving averages. As noted earlier, readings below 20% have characterized intermediate-term market bottoms in the past several years. I'll be returning to the Trading Psychology Weblog on Friday with a full update of market stats. Since 2000 (N = 1642 trading days), the Dow Jones Industrial Average has lost a little more than 750 points. It turns out, however, that those points are hardly evenly distributed by day of the week. On Fridays, the Dow has lost 3736.69 points. In other words, if traders had simply bought at the close on Friday and sold at Thursday's close, instead of losing over 750 points, they would have gained nearly 3000 points. 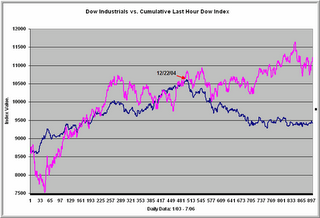 Since 2006, the Dow is down on the year, but once again is up on a Monday through Thursday basis. Overall, since 2000, we have had 161 up Mondays and 169 down. Conversely, we've had 161 up Mondays and 147 down. (Interestingly, Mondays have not been profitable during 2006). Could it be that risk-averse traders dump stocks on Friday, not wanting to hold positions over the weekend? If so, they've left an opportunity for those willing to assume risk by buying at the end of the week. Many of the measures I follow in the Trading Psychology Weblog each day are reflecting broad selling in the past several days. We recently saw stocks with significant downside momentum outnumber those with significant upside momentum by more than 10:1. Moreover, we've seen more sellers hitting bids than buyers lifting offers in the broad market for three consecutive days. During that time, declining stocks have outnumbered advancers by more than 2:1. Does that reflect a degree of indiscriminate selling that might be associated with a market bounce once more rational valuations kick in? I went back to 1990 (N = 4165 trading days) and, to my surprise, only found 41 occasions in which we've had a more lopsided ratio of decliners to advancers over a three-day period. That tells me that the recent selling is relatively extreme. I looked at all occasions since 1990 in which the number of declining stocks over three days outnumbered advancing issues by more than 2:1 (N = 140). Two days later, the S&P 500 Index was up on average by .49% (93 up, 47 down). That is much stronger than the average two-day gain of .07% (2225 up, 1940 down) for the entire sample. Interestingly, this pattern has held up during recent market history as well. Since 2004, we have had 27 occasions in which three-day declining stocks outnumbered advancers by more than 2:1. The S&P 500 Index was up two days later by an average of .52% (20 up, 7 down). It does appear that such broad and concentrated selling yields favorable returns in the short run. That doesn't mean, however, that the pattern is not without its risks. As we were making lows in August, 1990, the pattern yielded two-day losses in excess of 3% before the market righted itself. The pattern also got ugly as we made an important bottom in March, 2004, giving us two-day losses of 3%. In late August, 1998, the pattern would have provided us with a bonecrushing loss of 8% in two days, and in September, 2001 (right after 9/11), we would have had a loss of over 5% in that time. Note that the times the pattern failed big were relative washout periods in the market that ultimately provided superior buying opportunities. Ironically, when the pattern has failed in the short run, it has provided some of the best long-term returns. When markets go from a selling extreme to an even *greater* selling extreme, that's when you get bottoms of long-term interest. What prompted this Alphaville or Bob Dylan moment (actually, for the record, as I'm writing this The Sisters of Mercy are playing "More", which equally suits the occasion) was an exercise I tackled this weekend. I decided to research how I would make trading decisions if I *had* to place trades in the first few minutes after the open using only the most recent market data. Of course, this meant that I had to toss out all my historical research, indicators, etc. and figure things out from scratch. But it was amazing how I ended up seeing patterns in high frequency data that I would never have seen otherwise. It even gave me an idea for a promising trading concept, based on figuring out the early odds of trending vs. mean reversion. Of course, not everyone tackles these kinds of projects on weekends. Some people get by with a little understanding; some people get by with a whole lot more. If I have one fear, it's the fear of ossification. It's that body snatchers fear that somehow, someway you'll wake up and become like everyone else. You'll think the same thoughts you always thought, visit the same places, listen to the same music. Imperceptibly, you'll have become old. Not in years, but in spirit. I recently bought a new car. There were lots of great luxury cars on the market, with incredibly comfortable rides. So, of course, I bought the car with the performance-tuned suspension, rear wheel steering, and torque-at-every-point-in-the-curve. Not a comfortable car at all. Hard, like figuring out what to do in the markets based on several minutes of data. But there's something to be said for operating out of the comfort zone. Novelty keeps you fresh. Throwing away the old, and facing the world with an empty mind is a bit scary, but it's the only thing that lets new things inside. "If you want to drink new tea you have to get rid of the old tea that's in your cup, otherwise you cup just overflows and you get a wet mess. Your head is like that cup. It has a limited capacity and if you want to learn something about the world you should keep your head empty in order to learn it. It's very easy to spend your whole life swishing old tea around in your cup thinking it's great stuff because you've never tried anything new, because you could never get it in, because the old stuff prevented its entry because you were so sure the old stuff was so good, because you never really tried anything new...on and on in an endless circular pattern" (p. 25). Getting old is that endless circular pattern, the point at which you're snatched for good and forever entrenched in your comfort zone. Better to be forever young: to always be willing to operate outside of comfort, encounter new experiences, and learn new things. But that takes an empty mind and a willingness to throw out old tea. Back when I was in school, our teacher made us tell the class which animal we'd like to be. Some students wanted to be dogs, others cats, some horses. I said I'd like to be a moth, because moths burn themselves out chasing distant lights. That pretty well brought the exercise to a halt. But hey, hey, my, my, Neil Young would have understood. Human brains are wired to think inductively. If something happens, then it happens again, and again, again, and again, we begin to perceive a regularity. We expect rainstorms to follow from dark, threatening clouds, not bright, blue skies. We've seen the pattern many times before. It would be a strange world if hours of bright sun and blue sky increased the odds of rainfall, or if a stretch of rain suddenly reverted to brilliant, cloudless days. Yet that is the world of the stock market. After spending time at one extreme, it is wired to revert to the opposite extreme. That means that, just when human brains expect one extreme to persist, the other one kicks in. As soon as the trader is ready to bring an umbrella to work, the sun comes out. No sooner does the trader put on suntan lotion than clouds appear and drench the poor fool. There are all sorts of bits of wisdom about the market's tendency to reverse extremes. One trader recently reminded me that the truly great traders are bulls who buy big when the markets have made a plunge. "Yeah," I replied, "that's because they were smart enough to be in cash at the top." It's nice to put points on the board, but it's still defense that wins Super Bowls, dude. Quick: What's the total return of a trader who makes a 90% profit in Period One, 90% in Period Two, 90% in Period Three, and a 90% loss in Period Four? If I'm not mistaken, he's down nearly 33% on his original capital and needs a 50% gain just to return to where he started. That's where a 75% win/loss ratio will take you without risk management. That's important, because the market is wired differently from human brains in one other respect. We're accustomed to events that are normally distributed. We expect our children to grow to a height somewhere between 4 and 7 feet, with a nice big cluster of expectations toward the middle. But if the market governed the growth of our kids, we'd have occasional clusters of offspring that were doll-sized or true giants. Three standard deviation events occur about half of one percent of the time normally, but far more often in markets. So yes, while markets revert to their extremes, they also more often than normally push those extremes to extremes, wiping out those that rely on smug market wisdom. Which gets us back to playing defense. Even if your trading methods make you right 60% of the time and you trade once a day, you'll have, on average, five stretches of time in which you're wrong on four consecutive trades. Bet big on those four trades, and your winning system takes you to the poorhouse. Just a note of caution from the same guy who tells you that over 1000 stocks made fresh 65-day lows on Friday. When that has happened since September, 2002 (N = 42), the S&P 500 (SPY) has been up 20 days later by an average of 3.59% (33 up, 9 down). That's a whole lot better than the average 20-day gain of .92% for that period as a whole (612 up, 333 down). Of course, if you had bought that pattern in August, 1974 or October, 1987, the S&P 500 would have lost over 10% in a month's time, not one of life's kinder prospects for a leveraged trader. Go with the odds, but make sure you can survive the odds you're wrong. Better advice than that I cannot give. After Strong Downside Momentum Days: Does the Trend Tend to End? Readers of the Trading Psychology Weblog are familiar with the Demand and Supply measures, which reflect the number of operating company stocks that are displaying significant bullish momentum (Demand) and bearish momentum (Supply). I measure this by seeing how many stocks close above and below two volatility envelopes: one surrounding a short-term moving average, the other surrounding an intermediate-term moving average. To qualify, the stock must close above both envelopes. On Thursday, we had Supply exceed Demand by more than 10:1. I went back to September, 2002 (when I first began collecting these data) and looked at all occasions in which Supply was greater than 175 and exceeded Demand by at least 7:1 (N = 15). Instead of looking at what happens by the close of the following days (my usual analysis), I looked at the subsequent days' high and low prices in the S&P 500 Index (SPY). What I found was that, during the next day of trade, 14 of the 15 occasions traded above their close at some point during the day. But 13 of the 15 occasions also traded below their close during the day. In all, 12 of the 15 days traded *both* above and below their prior day's close. During the second day of trade after the extreme Supply reading, 13 of the 15 occasions traded above the close from the extreme day, and 13 also traded below the close. In all, 11 of the 15 days traded *both* above and below the close from two days prior. In other words, in the short run, once there has been an extreme momentum day to the downside, it has been common to get volatility--but not necessarily directional volatility. Rather, prices have tended to whip above and below the close of the extreme downside momentum day. This might provide a note of caution to traders trying to ride short-term trends. Is the market going to continue to trend or will it reverse? Take a basket of stocks that represents (i.e. is well-correlated with) the index you're trading. Count the proportion of those stocks that are making fresh closing highs minus lows on a three-hour basis and update that figure every 15 minutes. If more than half of the stocks are participating in a market move, the odds of continuation are improved. That was a useful guide today. Even on the rallies, 5 or fewer of the 17 stocks in my basket could muster new three-hour highs. On the declines, we consistently saw 10 or more registering new lows. The cumulative tally of new highs minus new lows might be viewed as a kind of trend measure itself. 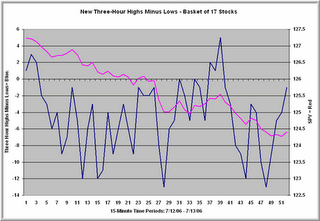 Time frames for new highs/lows shorter than 3 hours might help very short-term traders catch turns in markets. I've been working on a promising line of research that identifies the proportion of volume (intraday and daily) that is attributable to directional trading vs. arbitrage/program trading. It turns out that historical expectations are different when volume is elevated due to an increase in directional trading vs. an increase in arb. Along the way doing that research, I began to look at the proportion of ETF volume to total stock exchange volume. Specifically, following a line of research that I originally heard about from Jason Goepfert, I looked at the proportion of daily SPY volume to total NYSE volume. Yesterday, for example, we declined over 1% in SPY on an above-average proportion of SPY:NYSE volume. Since 2003 (N = 844 trading days), we've had 81 days in which SPY has declined by 1% or more. When the proportion of SPY:NYSE volume is above average (N = 40), the next two days in SPY average a gain of .44% (22 up, 18 down). When the proportion of SPY:NYSE volume is below average (N = 41), the next two days in SPY average a gain of only .13% (19 up, 22 down). Similarly, when SPY has risen by 1% or more (N = 81), the proportion of SPY:NYSE volume has made a difference. When SPY has been strong and SPY volume is high relative to NYSE (N = 40), the next four days in SPY average a gain of .55% (26 up, 14 down). When SPY has been strong and SPY volume is low relative to NYSE (N = 41), the next four days in SPY average a gain of only .03% (22 up, 19 down). This will be a promising line of research for other ETFs and their underlying indices. We have an unusual situation in which the S&P 500 Index (SPY) is up on a five-day basis thanks to yesterday's rally, but the NYSE Arms Index (TRIN) has been over 1.0 each of those five days. What this means is that volume has been concentrated in the falling stocks despite the fact that stocks overall have not been falling. What happens when the five-day Arms is high, but the market is up over that five-day period? Does the bull go away or is it one big holiday? First let's start with basics. Since 2003 (N = 842 trading days), we've had 211 days in which the five-day Arms Index has averaged over 1.0. Four days later, SPY has been up by an average .68% (143 up, 68 down). That is much stronger than the average four-day gain of .06% (335 up, 296 down) for the remainder of the sample. When the five-day Arms Index has averaged more than 1.0 and SPY has been up over that five-day period (N = 50), the next four days in SPY average a gain of .88% (39 up, 11 down). That's a helluva edge. I took a look at the high Arms/up SPY periods since 2005 to detect evidence of changing cycles (N = 20). The next four days in SPY averaged a gain of .46% (14 up, 6 down)--still a considerable upside edge. In short, when stocks overall are strong but volume is concentrated in weak issues, the outlook for the market has been bullish. On average, it takes volume chasing the rise to put an end to the bull. We've seen heavy selling in the NASDAQ 100 Index (QQQQ) over the past four days, with the NASDAQ TRIN (Arms Index) averaging a whopping 2.15. Since March, 2003 (N = 842 trading days), when the four-day NASDAQ Arms Index averages over 1.5 (N = 71), the next four days in QQQQ average a very solid gain of 1.29% (50 up, 21 down). That's much stronger than the average four-day gain of .13% (411 up, 360 down) for the remainder of the sample. By now, we've learned that patterns can shift. So I looked at the four-day NASDAQ Arms Index pattern since 2005 to see what has happened next. When the four-day Arms Index has exceeded 1.5 (N = 18), the next four days in QQQQ have averaged a gain of .62% (13 up, 5 down)--again much stronger than the average index performance. Interestingly, the edge has seemed to be on a multiday basis; the next trading day, we don't see a bullish edge. My recent analyses are highlighting the importance of choosing the proper lookback periods for assessing market patterns and tendencies. On Monday, we found the S&P 500 Index (SPY) establish some support near its Friday low, bouncing late in the day. I decided to look at days in which the low price of the day was within .10% of the low for the previous day. These can be viewed as candidates for double bottoms in the market. But do they really behave that way? From March, 2003 to the present (N = 842 trading days), we've had 124 candidate double bottom days such as Monday. Two days later, SPY is up by an average of .19% (74 up, 50 down). That is stronger than the average two-day gain in SPY of .11% (452 up, 390 down). When we divide the double bottom day sample in half, however, based upon when they occurred, a distinct pattern emerges. When the double bottom patterns happened relatively early in the bull market (N = 62; March, 2003 - December, 2004), the next three days in SPY averaged a robust gain of .33% (41 up, 21 down). When the patterns have occurred later in the bull market (N = 62; late December, 2004 to the present), the next three days in SPY have averaged a tepid gain of .05% (33 up, 29 down). Think of it this way: trends are what happen in between periods of consolidation. The double bottom formation is capturing a short-term consolidation in the market. Such consolidations tended to be followed by short-term gains in 2003-2004, but that has not been the case since then. How markets behave in the face of consolidation is itself a worthy trend indicator, one reason I track what the market does following "neutral trend periods" in the Trading Psychology Weblog. Down Day at the End of a Down Week: Changing Cycles? Friday was a down day at the end of a five-day down period. What have been recent expectations after we've had a down session at the end of a down week? Since 2004 (N = 628 trading days), we've had 142 down days at the end of down weeks. Four days later, the S&P 500 Index (SPY) has been up by an average .21% (85 up, 57 down). That is considerably stronger than the average four-day gain of .05% (259 up, 227 down) for the remainder of the sample. Interestingly, however, during 2006 this pattern has not been profitable (N = 29). Four days after we've had a down day at the end of a down week, SPY has been down on average -.11% (16 up, 13 down). This is but one example of how patterns that were showing up earlier in the bull market are not panning out well in the present environment. A similar shift of patterns occurred early in 2000 and was a helpful alert to a major change in trend. Semiconductor stocks ($SOX) have been weak of late, but it's important to take a step back and recognize that these stocks have been weak for years now. Let's go back and retrace the incredible bull and bear run in these issues and see if we might learn something about the dynamics of market bubbles and their bursting. We start in October, 1996. The SOX is trading in the 180s. Six months later, the SOX had gained 50%, reaching the 290s in February of 1997. By August of that year, the SOX was trading in the 390's--a double within a year's time--before thudding back to earth in the 240s by the end of the year. By April, 1998, the SOX is back to the 320s, rising about a third in several months' time, before again crashing to the 180s in October of that year. What we see in the SOX are periods of significant boom and bust that left the average unchanged over a two-year period and this was before the real boom and bust had occurred! In other words, the prelude to the bubble and the burst of the bubble was significant volatility. Now the bubble begins in earnest. From October, 1998 to January, 1999 the SOX index doubles in value. A consolidation through May of that year is followed by another 50% spike higher by September, 1999, leaving the SOX in the 570s. Within a year's time, the SOX has tripled in value. A quick bust in October, 1999 takes about 100 points off the index, but this ground is retraced--and more--by the end of the month. Then, from October, 1999 to March, 2000, the SOX moves steadily higher to an amazing 1362: well over doubling in less than half a year's time. Indeed, in about a year's time, the SOX had almost quadrupled in value. Now came the bust. Just one month later, in April, 2000, the SOX was down to the 870s, an amazing drop of over a third. The average made it back over 1200 by July of that year--incredible volatility--only to fall back to the 880s later that month and rise back to the 1100s in September. Then, by November, the SOX dropped all the way to 516: more than a 50% drop in just two months. We bounced to the 700s by January, 2001--still significant volatility--but that would prove the index high that year. In the aftermath of 9/11, the SOX declined all the way back to the 340s. And the eventual market bottom? After a vigorous bounce to the 600s in March, 2002 (still phenomenal volatility), we dropped unceremoniously to the very low 200s in October of that year. With that, we had retraced nearly all gains back to that 1996 beginning. The SOX bounced nicely after that, hitting 560 in January, 2004. Since then, levels above 500 have been stymied. Most recently, we peaked in the 530s in April, 2006 and are now trading in the 420s. What the SOX tell us is that, even with the bull market of 2002-present, we are down 2/3 from the market peak in 2000 and down even from that bounce off the September, 2001 lows. While much of the rest of the market has been in bull mode--especially the smaller caps--the SOX (and much of its NASDAQ cohorts) has been unwinding its market bubble. If the bubble experiences of gold in 1980 and Japan's stock market in the late 1980s are any indication, it could take years to unwind the incredible run in the SOX. Indeed, as hard as it may be to fathom, it may well be that we have not yet seen the ultimate post-bubble lows in many of these stocks. And the bubble markets of today? We will see them first by their boom-bust volatility; then by their ramping volume and new highs. As we can see from the SOX, however, these remain volatile--and potentially profitable--trading vehicles well after their bull peaks. In their boom-bust behavior, gold (and other metals) and emerging country stocks are certainly candidates. An important paper by Lee and Swaminathan details the momentum lifecycles of stocks. If you read it carefully, you'll develop a deep appreciation for how booms and busts occur--and how you might locate the next ones. The QQV is a measure of the implied volatility of a hypothetical at-the-money QQQQ (NASDAQ 100 Index) option, expressed as an annual standard deviation of returns. It is intended as a measure of trader sentiment regarding future volatility of the Index. Like the better known VIX, QQV tends to rise in falling markets and fall in rising markets. Since 2004 (N = 623 trading days), when QQV has made a 10-day low (N = 102), the next five days in QQQQ have averaged a loss of -.14% (49 up, 53 down). That is worse than the average five-day gain in QQQQ of .08% (271 up, 250 down) for the remainder of the sample. On the other hand, when QQV has made a 10-day high (N = 87), the next five days in QQQQ have averaged a sizable gain of .48% (55 up, 32 down). That is much stronger than the average five-day loss in QQQQ of -.03% (265 up, 271 down). It appears that when traders are feeling safest--i.e., expecting the least volatility--returns are subnormal in the NASDAQ. When traders are expecting the greatest turmoil, returns are superior. Perhaps there really is opportunity in crisis! In the last post, we saw how time can serve as a market indicator that measures how long it takes an expectable event to occur. The longer we had gone without seeing a five-day price high, the more bullish were the near term returns. In a Trading Markets article due out today, I also found this dynamic to hold for the number of 20-day lows exceeding 20-day highs. The longer it takes for us to get a reading in which 20 day highs exceed 20-day lows, the more bullish the short-term outcomes. (Note: 20 day new highs and lows are reported daily in the Trading Psychology Weblog). But does this dynamic work the other way as well? If we see a long time pass before we see 20-day new lows exceed new highs, does that have bearish implications? It appears so. Since 2004 (N = 609), we've had 84 daily occasions in which there have been 15 or more days passing before we've seen 20 day lows exceed new highs. Five days later, the S&P 500 Index (SPY) has been down by an average -.22% (39 up, 45 down). That is much weaker than the average five-day gain of .16% (296 up, 229 down) for the remainder of the sample. Once again, we see that the market confounds human nature. Returns are subnormal when we've had a run of market strength (new highs outnumbering new lows) and--as the Trading Markets article shows--returns are superior when we've had a run of market weakness (new lows outnumbering new highs). What this indicator is tapping, I believe, is cyclical behavior in the markets. By measuring the time that elapses before bullish or bearish market events occur, we are really assessing the aging of market cycles. It is not surprising from this vantage point that, as cycles age, countertrend returns become superior. It will be interesting to look at this phenomenon on longer time frames. Normally, we look for the occurrence of an event to signal a possible directional edge in the marketplace. In this analysis and the ones that will follow, we're actually looking at the absence of an occurrence as our market signal. Specifically, we'll take a look at how many days pass in the market before we see the S&P 500 (SPY) make a five-day price high. If many days pass without a five-day price high, we know we've been in a downtrend. If zero days pass without a five-day high, that means that the current trading session includes a five-day high. Since March, 2003 (N = 833), we've had 77 days in which eight or more days have lapsed before making a five-day high. (The largest number of days without a five-day high during this period was 15, achieved during May, 2004 and March, 2005). Two days after the string of eight or more days without a high, SPY was up by an average of .39% (51 up, 26 down). That is much stronger than the average two-day gain of .07% (397 up, 359 down) for the remainder of the sample. When the market has actually made a five-day high during the current trading session (N = 298), the next two days in SPY have averaged a gain of only .03% (156 up, 142 down). Streaks without a five-day high have thus been bullish in the short run, while the achievement of a five-day high has led to subnormal returns in the near term. This is a good example of how the market runs contrary to human nature. After many days without price highs, traders tend to become bearish (as shown by sentiment measures). Once we achieve price highs, there is a tendency to become bullish. This overweighting of recent market information keeps players on the wrong side of short-term market cycles. On Friday--and then again on Monday--the number of stocks making fresh 20-day highs itself made a high reading for the past 20 sessions. Since 2004, we've had 43 occasions in which the 20-day highs have made 20-day highs. What we see going forward is a modest short-term momentum effect in the S&P 500 (SPY). Two days later, SPY is up by an average .22% (25 up, 18 down), stronger than the average gain of .06% for the sample overall. Beyond two days, going out to as far as 20 days, there is no edge when new highs hit new highs. It has not been profitable to short such occasions overall; but neither have there been superior upside returns. Since 2004, when 20-day highs have made 5-day peaks, but not peaks at 10 and 20 days (which tends to occur in topping markets), returns over the next two days are actually subnormal. It's when 20-day highs are also at 20-day highs that we see the modest momentum effect. Three Consecutive Days of Buying: What Happens Next? We've had three consecutive days of strong buying, as shown by high readings of over +400 in the Adjusted NYSE TICK (quoted daily in the Trading Psychology Weblog). Since July 2003 (N = 750 trading days), we've had 24 similar occasions of strong buying for three straight days. On average, the next trading day in the S&P 500 Index (SPY) has risen by .32% (16 up, 8 down). That is considerably stronger than the average one-day gain of .03% (397 up, 353 down) for the sample overall. Viewed differently, when the Adjusted TICK has averaged more than +500 per day over a three-day period (N = 47), the next three days in SPY have averaged an impressive gain of .46% (34 up, 13 down). That is much stronger than the average three-day gain of .09% (427 up, 323 down) for the entire sample. As noted in the previous post, periods of very strong buying, as measured by the Adjusted TICK, tend to be followed by strength in the short run. We have had a solid burst of buying off the recent lows, kicked off by the Fed announcement. Such bursts, on average, have not quickly reversed themselves. I mentioned yesterday that we were not, as of that writing, at a point where we typically see positive momentum effects. With Monday's solid buying, that is no longer the case. The Adjusted NYSE TICK is a measure of the number of stocks trading at their bid vs. offer price at 10 second intervals through the day, with the raw values adjusted to create a zero mean. This statistic is summed to create a daily measure of buying and selling pressure and is reported each day on the Trading Psychology Weblog. The Adjusted TICK captures interesting short-term momentum effects in the S&P 500 Index (SPY). Since July, 2003 (N = 741 trading days), when the five-day Adjusted TICK has exceeded 1500 (N = 71), the next five days in SPY have averaged a gain of .53% (49 up, 22 down). That is much stronger than the average five-day gain of .16% (414 up, 327 down) for the sample overall. This suggests that strong buying interest tends to be followed by additional market strength in the short run. When the five-day Adjusted TICK has been less than -1500 (N = 78), the next five days in SPY have averaged a gain of .54% (50 up, 28 down). Again, this is much stronger than the average five-day gain. This indicates that strong selling pressure tends to reverse in the near term. The bottom line is that, on a five-day basis, very strong, positive Adjusted TICK readings and very weak, negative readings have been associated with favorable returns. When the Adjusted TICK has been neither very strong nor weak (N = 592), the average five-day gain in SPY has been only .06% (315 up, 277 down), far weaker than when the Adjusted TICK is nearer its extremes. Of the indicators I've tested, the Adjusted TICK appears to be most sensitive to these momentum effects. Interestingly, despite the big rise in the market on the heels of the Fed announcement, we are not at a level in the Adjusted TICK that is normally associated with short-term positive momentum effects. I recently posted on the topic of when Demand (the number of stocks displaying significant upside short- and intermediate-term momentum) exceeds Supply (the number of stocks displaying significant downside momentum on both timeframes). These figures, recall, represent an index computed from the number of operating company stocks that close above and below volatility envelopes surrounding two moving averages. The daily values are posted daily to the Trading Psychology Weblog. I've noticed over the years that, by cumulating the daily difference between Demand and Supply, we obtain a very reliable overbought/oversold indicator. Since October, 2002 (N = 946 trading days), this index has varied between +57 and -36. The value of this cumulative Demand/Supply Index have correlated quite nicely with five-day returns in the S&P 500 Index (SPY). After Thursday's sizable rally, we hit an overbought cumulative index value of +50. Since October, 2002, we've only had 20 daily readings of +50 or greater. Over the next five days, the S&P 500 Index has averaged a loss of -1.05% (! ), with 3 occasions up, 17 down. That's about as sizable a downside edge as I've seen from an indicator. Overall, when the cumulative Demand/Supply Index has been in negative territory (N = 208), the next five days in SPY have averaged a gain of .59% (126 up, 82 down). When the index has been in positive territory (N = 738), the next five days in SPY have averaged a gain of .10% (401 up, 337 down). In general, readings above +40 have yielded meaningfully bearish returns; readings below -10 have been extremely bullish. The low for the recent downturn was -2 on 6/14; at the May peak on 5/5, we saw a reading of +55. I'll keep a close eye on this unusually sensitive indicator and report readings on the Trading Psychology Weblog and further research here. As noted in recent posts here, the Trading Psychology Weblog tracks Institutional Buying and Institutional Selling as separate variables. Often, as before the Fed announcement, markets will move up not because of high buying, but because of the absence of normal selling activity. Other times, as on the Thursday of the Fed announcement, we see the market move up on *both* above average buying *and* below average selling. This reveals a true demand among institutions. Going back to July, 2003 (N = 742 trading days), I found 25 days in which Institutional Buying was very strong (over +400) and Institutional Selling was very light (over +400). Interestingly, there was no edge for the next day of trading, as the average price change for SPY was a loss of -.09% (12 up, 13 down). This is weaker than the average one-day change of .03% (404 up, 338 down) for the sample overall. By four days out, however, the strong Institutional Buying days averaged a gain of .20% (15 up, 10 down). This is modestly stronger than the average gain of .13% (409 up, 333 down) for the sample as a whole. This is a common pattern I've found after market gains: very near term consolidation followed by renewed short-term strength. We saw a bit of that consolidation on Friday and, post holiday, will have an opportunity to see if this rise lives up to the historical pattern.